Jerked up a bar of 216 lb. twelve times with both hands. 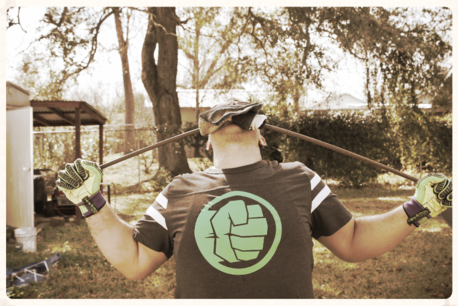 Jerked up a bar of 187 lb. seven times with one hand. Pressed up a bar of 216 lb. with one hand. About this time I thrown in contact with a remarkable man, who exercised a notable influence on my future life. A slight injury sustained in the exercise of my calling as an engineer - for I was still an amateur - made it necessary for me to seek the help of a doctor. This doctor, an amiable old gentleman, happened to have staying with him a distinguished colleague, Dr. von Krajewski, a physician in ordinary to His Majesty the Czar. This Dr. von Krajewski was the founder of the St. Petersburg Athletic and Cycling Club, of which H.R.H. the Grand Duke Vladimir Alexandrovitch was President, and which included many aristocratic and wealthy people among its members. 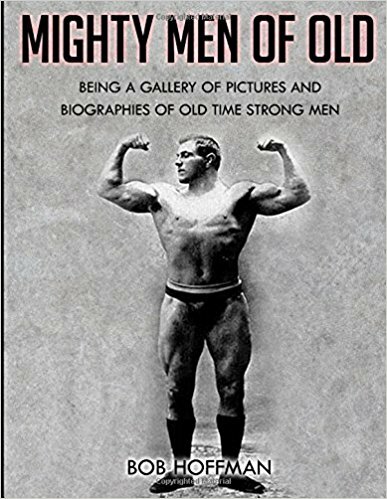 Dr. Krajewski, in spite of his fifty-six years, was still a very active and energetic man, and particularly keen on feats of strength and weight-lifting. He had first taken up this pastime at the mature age of forty-one, and by systematic training had attained a fairly high degree of physical strength. The doctor had, of course, visited our club and recognized me at once. When I had completely undressed in order to facilitate a careful examination of my injury, he, in conjunction with my own doctor, examined my body, and found that with the exception of a slight injury ( a contusion of the arm ) I was perfectly sound. He invited me to come and stay with him in St. Petersburg as he wished to have me trained as a professional athlete and wrestler. 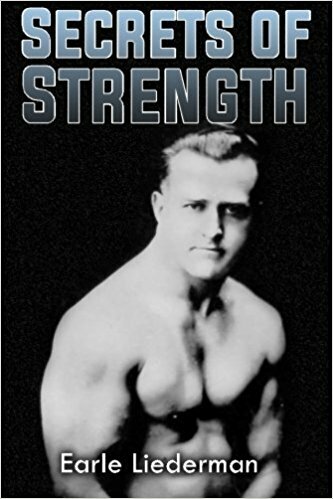 I learned that Dr. von Krajewski had also had Lurich in training with him for some time, and he was good enough to say that I possessed possibilities of becoming the strongest man in the world. Yielding to the persuasion of all my club friends, who congratulated me warmly on Dr. von Krajewski's offer, but against the wishes of my parents, I set out for St. Petersburg early in 1898. Dr. von Krawjewski was a bachelor and lived in a large house in the Michael Platz, St. Petersburg. He had an excellent practice in the highest circle of society and passed for a millionaire. I was most hospitably received in the house of this patron of athletics. 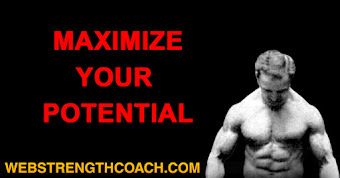 The doctor treated me like a son and gave me the best training his experience could suggest. One room in his house was hung with portraits of all the best-known strong men and wrestlers, and he delighted in inviting them to his house, in which all foreign artistes found hospitable welcome every month. 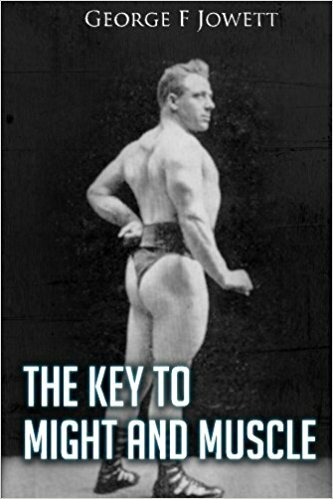 Dr. von Krajewski was the organizer of a private club of men of fashion who came to him weekly and worked hard with weights and dumb-bells, and practised wrestling. 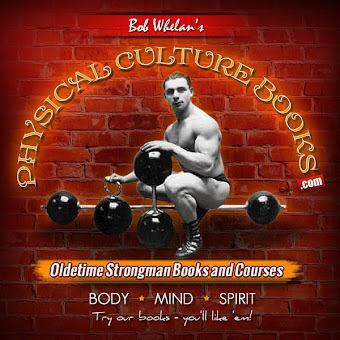 In his gymnasium the doctor had a great number and variety of weights, dumb-bells, and other apparatus and appliances for the purpose of training. It was, in short, a fully equipped school of physical culture. All the professional strong men and wrestlers who appeared at the St. Petersburg theatres visited Dr. von Krajewski and gave exhibitions of their art. While so doing, they were all carefully examined, measured and weighed. 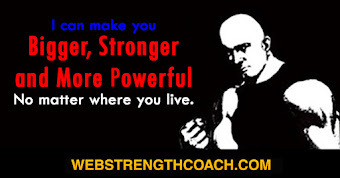 Dr. von Krajewski had thus been able to acquire great experience and knowledge of feats of strength and methods of training. The example set by these artistes had a most stimulating influence on us all. Every one seem put upon his mettle to do his very best. Having now nothing to occupy me but alternate exercise and rest, I made rapid progress in strength. The doctor told me not to touch alcoholic drinks and tobacco, for neither of which I had every felt any great inclination, and in neither of which I had ever indulged. I drank little else but milk, (3 litres, or more than 11 pints daily) and ate practically what I pleased, my appetite being then, as always, an excellent one. I bathed daily with the Doctor in his bath-room, a very spacious apartment built in close proximity to the gymnasium. After the bath we practised weight-lifting till we got dry, neither of us using the towel to dry ourselves. 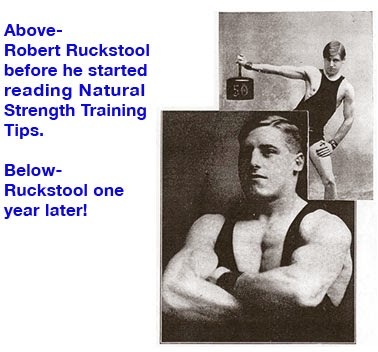 In January, 1898, I pushed up a bar weighing 275 lb. to the full height of the arms and with the right hand pushed up 243 lb., and lying on the ground, I lifted and pushed up with two hands a weight of 304 lb., following this soon after with one 335 lb. With the knees bent I raised a weight of 180 1/2 lb., which remained a world's record for many years till beaten by me with 187 lb. in 1902. I February, I accompanied Dr. von Krajewski to Moscow, where Baron Kister, another great patron of athletics, had organized a weight-lifting competition for amateurs. I was fairly successful here, and managed to raise a weight of 255 1/2 lb. with one hand. For this feat I was soon after my return awarded a gold medal by my club, the St. Petersburg Athletic and Cycling Club, of which I had become a member. The training at Dr. von Krajewski's was very many-sided and I rapidly gained strength in all parts of the xbody. I also trained steadily in wrestling, the frequent visits of professional wrestlers to the doctor's house affording me many excellent opportunities. About this time Count Ribeaupierre, Master of the Horse to H.M. the Czar, became President of the St. Petersburg Athletic and Cycling Club. This gentleman took a keen interest in me and has continued to manifest his good will towards me ever since. He afterwards frequently supported and helped me, and I feel that I owe him a debt of gratitude. In April, l898, my club organized a weight-lifting competition for the championship of Russia, in which I won first prize and accomplished the following among other feats. With both hands I lifted 114 kilogrammes or 251 lb. to full height of arms with a jerk ( being only 1 kilogramme less than the world's record of the Frenchman, Bonnes - 115 kilogrammes). I snatched up 257 lb. with both hands. With the right hand jerked 231 lb. With the left hand jerked 205 lb. With the right hand pressed 269 lb. Towards the end of April the famous French wrestler, Paul Pons, came to St. Petersburg, and defeated this practised wrestler at the end of forty-five minutes. I also threw Jankowsky in eleven minutes. It is possible that Pons may not have been in his best form on this occasion as he himself maintained, for some time afterwards I had a much tougher struggle with him. I was in tip-top condition and was continuing to train steadily when Dr. von Krajewski put down my name to contest the championship of the world and the championship of Europe at the end of July and beginning of August which were to be wrestled for in connection with the Sports Exhibition in Vienna. Height…………5 ft. 9 1/2 in. Weight…………14 st. Waist……………32 3/8 in. Neck………………18 1/3 in. Chest and Shoulders…………47 3/4 normal and 51 in. expanded Right Shoulder Joint………21 7/8 in. Left Shoulder Joint…………21 1/2 in. Biceps of right arm…………15 1/4 in. 16 3/4 in. Biceps of left arm……………14 7/8 in. l6 1/2 in. (measured when flexed and straight.) Forearm, right………………………13 5/8 in. Forearm, left…………………………13 1/4 in. Right and left wrist………7 3/4 in. Right and left thigh…….24 1/4 in. Calf……………………………………………….15 1/4 in. Ankle…………………………………………….9 1/8 in. I jerked a bar weighing 306 lb. with both hands. I pulled in clean to the shoulders a bar weighing 361 lb. I snatched a bar weighing 197 1/2 lb. with the right hand (a world's record). These feats were performed either in the Doctor's gymnasium or in Count Ribeaupierre's riding school and the weights were in every instance carefully checked. This reminds me of a humorous incident over which I have often laughed heartily. The doctor was at this time wearing a new pair of trousers, which fitted him exceedingly well, inasmuch that I more than once expressed a wish to possess similar garments. Dr. von Krajewski jestingly replied, "My dear George, when you can beat Sandow's world's record of putting up 116 kilogrammes or 255 1/2 lb. with one hand you shall have just such another pair!" It may have been this jest which spurred me on to make a special effort by pulling up a weight of 122.25 kilogrammes (269 1/4 lb. English). This was done in Count Ribeaupierre's private riding school, which was arranged for this occasion like a circus. The place was filled with a large audience of some of the most distinguished people in St. Petersburg. When I lifted this weight Dr. Krajewski in front of all the people rose from his seat, and lifted his hat to full arm's length above his xhead. I shall never forget the doctor on this occasion. 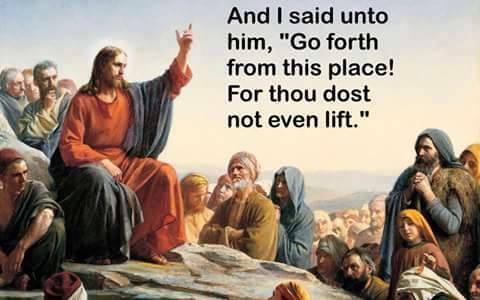 His admiration for feats of strength was almost beyond understanding. Everybody was surprised by this evidence of his genuine emotion, and it seemed as though his enthusiasm spread itself over the whole of the audience, everybody congratulating me warmly. The doctor disappeared for a few minutes and returned with the promised pair of trousers. I don’t mind admitting that, at the moment, I was almost more pleased with this gift than with the large gold Record Medal solemnly presented to me a few days later.